INDIANAPOLIS – The Indianapolis Indians are offering fans a way to help with hurricane relief efforts already underway. In collaboration with the American Red Cross, the Indians will donate a $1 for every ticket sold to their playoff games at Victory Field. The first game in Indianapolis is Friday, September 8 at 7:15 p.m. The Indians play their first postseason game at home on Friday, September 8, which is Game 3 in their first round best-of-five series versus the Durham Bulls. First pitch is scheduled for 7:15 p.m., with the first 1,000 fans getting an Indians playoffs t-shirt. Fans are encouraged to stick around after the game for the season’s last on-field Friday Fireworks display. If the Tribe advance past Durham, they host Games 1 and 2 of the Governors’ Cup championship series on Tuesday, September 12 and Wednesday, September 13. 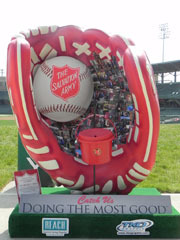 Both games are scheduled to start at 7:05 p.m.
INDIANAPOLIS – After eight specialty jersey auctions during the 2017 season, the Indianapolis Indians have donated $48,953.18 to six local nonprofit organizations. The Tribe wore specialty jerseys for eight games this season, with custom designs ranging from super heroes like Superman and Batman to patriotic uniforms for Memorial Day and Independence Day. Eight times this season, the Indians wore specialty jerseys customized to the theme of that day’s game. Each game-worn jersey was auctioned off during the games, with proceeds benefitting local nonprofits partnered with each game. Beneficiaries this season were Community Health Network Foundation (May 13 – Guardians of the Galaxy), Indiana National Guard Relief Fund (May 20 – Camouflage and July 4 – Stars & Stripes), Ronald McDonald House Charities of Central Indiana (June 3 – Superman and August 12 – Batman), Make-a-Wish Foundation (June 10 – Teenage Mutant Ninja Turtles), Riley Children’s Foundation (July 1 – Captain America) and Shepherd Community Center (July 29 – Thor). The Tribe’s final home game of the regular season is Fan Appreciation Day on Sunday, August 27. The Indians and Pepsi say thank you to fans by offering the chance to win TVs, Beats headphones, Indians jerseys, t-shirts and more. All fans who enter the Victory Field gates for that day’s game are entered to win prizes. 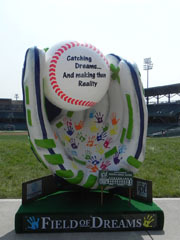 For tickets to Sunday’s home regular season finale, visit IndyIndians.com or the Victory Field Box Office. Playoff tickets are on sale for season ticket holders and will go on sale to the general public once the Tribe clinch a postseason berth. 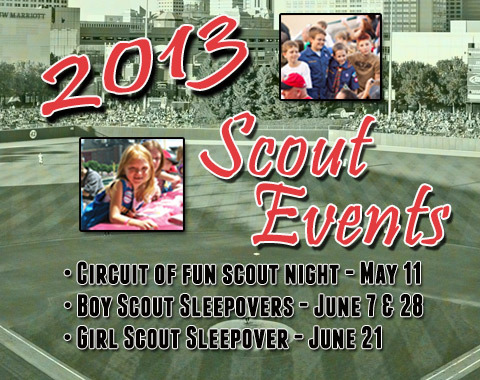 The Circuit of Fun Scout Night will officially kick off the 2013 slate of Boy and Girl Scout events. INDIANAPOLIS — The Indianapolis Indians will officially kick off their 2013 slate of Boy and Girl Scout events with the Tribe’s first ever Circuit of Fun Scout Night. This year’s new event is set for Saturday, May 11 and will include an exciting pre-game Scout party before the Tribe’s 7:05 p.m. contest against Toledo. Scout groups participating in the first annual Circuit of Fun Scout Night will be treated to free games in the PNC Plaza located in center field, and have the option of purchasing a discounted food and drink package during the pre-game party, scheduled from 4:00 p.m. to 5:30 p.m. The Tribe’s award-winning mascot Rowdie will also be on hand to sign autographs and entertain patrons, as well as several players from the first-place Indianapolis Indians squad. Tickets to the Circuit of Fun Scout Night include admission to the regularly scheduled Indians game, a special patch to commemorate the event and the opportunity to stick around after the evening’s contest to run the bases. The Tribe’s Circuit of Fun Night is only the first of four fantastic scouting events scheduled this year at Victory Field. 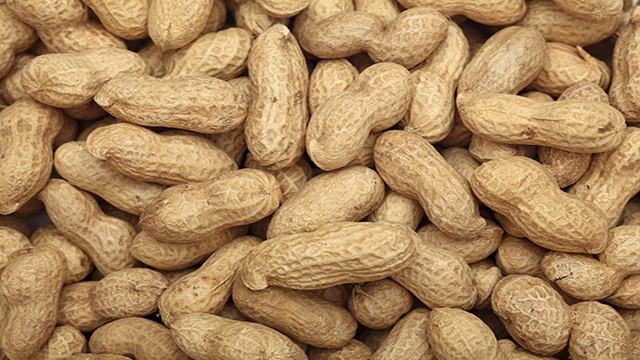 The Indians will also be hosting overnight Boy Scout Campouts on Friday, June 7 and Friday, June 28, as well as a Girl Scout Campout on Friday, June 21. Reservations for the first annual Circuit of Fun Night and the Boy and Girl Scout Campouts, which historically sell out, can be made by visiting IndyIndians.com or calling the Victory Field Box Office at (317) 269-3545. Victory Field will host several exciting Scout Events during the 2013 season. INDIANAPOLIS — The Indianapolis Indians are proud to announce the 2013 schedule of the annual Boy and Girl Scout events at Victory Field. 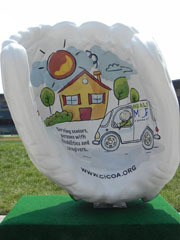 This year’s slate will include three overnight campouts, as well as the Tribe’s first ever Circuit of Fun Scout Night on Saturday, May 11, which will include pre-game festivities and a post-game bases run. Scout groups participating in the first annual Circuit of Fun Scout Night will be treated to free games in the PNC Plaza located in center field, and have the option of purchasing a discounted food and drink package during the pre-game party, scheduled from 4:00 p.m. to 5:30 p.m. The Tribe’s award-winning mascot Rowdie will also be on hand to sign autographs and entertain patrons, as well as several players from the 2013 Indianapolis Indians squad. 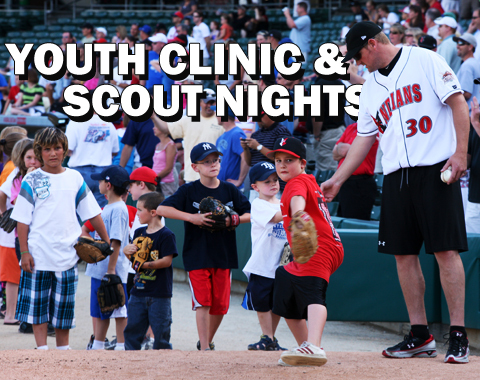 Tickets to the Circuit of Fun Scout Night include admission to the regularly scheduled Indians game, a special patch to commemorate the event and the opportunity to stick around after the evening’s contest to run the bases. Victory Field will turn into an overnight camp ground for troops, dens and packs during the Tribe’s Boy and Girl Scouts Campout events. The fun-filled evening will begin with the regularly scheduled Indians game, followed by a fantastic fireworks show. Campout participants can remain in the ballpark after the game and are treated to popcorn and a movie on the videoboard. Scout groups will also have the opportunity to take to the Tribe’s outfield to set up their tents for the evening, with the grand event being capped off by breakfast on Saturday morning. Overnight Boy Scout Campouts are set for Friday, June 7 when the Indians take on the Durham Bulls at 7:15 p.m., and Friday, June 28, as the Tribe battles the Rochester Red Wings at 7:15 p.m. The Girl Scout Campout is scheduled Friday, June 21 immediately following the 7:15 p.m. contest between the Tribe and the Charlotte Knights. 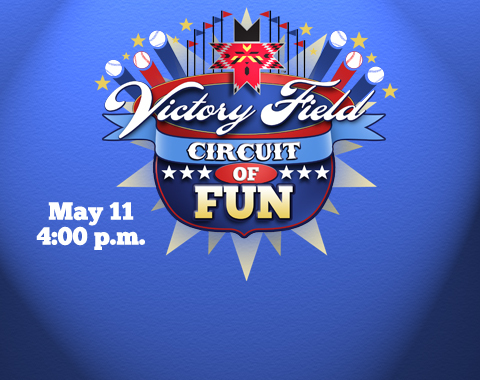 Reservations for the Boy and Girl Scout Campouts, which historically sell out, and the first annual Circuit of Fun Night can be made by clicking here or calling the Victory Field Box Office at (317) 269-3545. Scout Campouts and the annual Youth Baseball Clinic give kids an exclusive on-field experience. INDIANAPOLIS — The Indianapolis Indians are proud to announce the return of the annual Youth Baseball Clinic as well as Boy and Girl Scout overnight Campouts for the 2013 season. Troops, dens and packs can pack Victory Field for a full night of exciting activities during the Tribe’s Boy and Girl Scouts overnight Campout events. The fun begins with the regularly scheduled Indians game, followed by a fantastic fireworks show. Campout participants can remain in the ballpark after the game and are treated to popcorn and a movie on the videoboard. Scout groups will also have the opportunity to take to the Tribe’s outfield to set up their tents for the evening, with the grand event being capped off by breakfast on Saturday morning. Reservations for the Boy and Girl Scout Campouts, which historically sell out, can be made by clicking Scout Events or calling the Victory Field Box Office at (317) 269-3545. The 2013 Youth Baseball Clinic will also offer fans an exclusive on-field experience as participants will receive one-on-one instruction from the Indianapolis Indians’ coaches and players. The clinic, which is set for Thursday, June 6 at 5:00 p.m., includes several skills stations which will focus on various throwing, fielding and pitching drills. All kids ages 14 and under may participate in the event and admission is included with the purchase of a single-game ticket to Thursday night’s game between Indianapolis and the Durham Bulls. Individuals interested in participating in the 2013 Youth Baseball Clinic are not required to register for the event, and only need to buy a June 6 game ticket and arrive at Victory Field by 5:00 p.m. Groups of 25 or more patrons will receive a $3 discount off the ticket price, and those with 100 or more participants will be granted $4 off game-day admission. To book a group outing for the 2013 Youth Baseball Clinic fans can call the Victory Field Box Office at (317) 269-3545. What could be better than playing basketball in an air-conditioned gym on a hot summer day? How about playing basketball with a professional baseball player? Jeff Clement, first baseman for the Indianapolis Indians, spent the morning playing and hanging out with the kids at The Salvation Army’s Eagle Creek Community Center. “Today was a great opportunity to come down to The Salvation Army and spend time with these kids. It’s more fun, than anything because I’m just a big kid myself,” said Clement. The kids are all part of The Salvation Army’s Summer Food Program, which provides nutritional meals for at-risk youth in the Eagle Creek area. “For some of the kids here, this is the only full meal they get during the day,” said Captain Leti Crowell, Corps Officer for The Salvation Army Eagle Creek. The program was started to bridge the gap between school sessions. Nearly all of the children qualifiy for the Federal School Lunch program and many would go without a quality meal this summer without the help of The Salvation Army. A big part of the day is organized recreation and when Clement heard about the opportunity to go and play with the kids, he jumped at it. “It means so much to these kids that a player like Jeff Clement of the Indians cares about them enough to take time out of his schedule to come and play with them for a few hours. These kids aren’t just hungry for food, they’re hungry for attention. They’re going to go home after this and talk about it for a long time,” said Captain Crowell. This is the second year that players from the Indianapolis Indians have spent a day with the kids at the Eagle Creek Salvation Army. Last summer, Indians pitchers Eric Hacker and Chris Bootcheck played whiffle ball with kids. 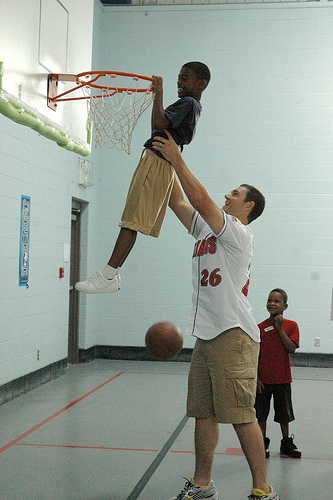 Jeff Clement, first baseman for the Indianapolis Indians, helps 10 year old Mikhal dunk.